When we launched BLT, one of our first posts was a Fan's Guide to the US Open. We decided there were some updates in order to help you maximize your 2013 Open. Without further ado, here's the Blacklabel Tennis Guide to the 2013 US Open. Who needs the big, overblown, traditional holidays? You can keep your thanksgiving turkeys, your 4th of July fireworks, your Santa Claus. For this guy, the most wonderful time of the year is the start of another US Open tennis tournament. Oh, it's not absolutely perfect; the weather always seems to veer from sweltering when the first ball is struck, to sweatshirt weather by the end; the food prices always make me wonder why the USTA didn't hire Kanye West's jeweler to build a platinum and diamond encrusted roof over Arthur Ashe stadium and frankly, there's always a point where I get tennis fatigue and have to leave a bit early for the day, but there's no time of the year I look forward to more than the US Open. So, why am I writing this unofficial guide to the US Open when there are so many official sources out there? Well, to be frank, because I'm me. Living in New York, the US Open is my hometown major, one of the biggest events of the year and the tournament I know the best. Unlike the professional beat writers who generally spend the tourney shuttling off to the press conferences and have cordoned off seats at the show courts, I've only ever experienced the Open like you, as a fan. I boil in the summer heat like every other fan, I get no closer to the players than anybody else with an oversized tennis ball, I pay $4.75 for my Evian just like the rest of the hoi polloi. In other words, for the last decade, I've experienced the Open in the exact same way you will and have learned a few tips and tricks that I think will help you (whoever you are) maximize your trip to the US Open. We have to start by knowing our audience; how do you want to experience the tournament? Everyone seems to come to the US Open with their own vision of what a great experience would be and luckily enough, the grounds of the USTA Billie Jean King National Tennis Center (USTABJKNTC for short...ish) are big enough to fulfill them all. Fans - Live for the US Open, they follow the other tournaments regularly; they can name and identify players (and maybe a few coaches) on sight and they can tell you exactly where they spent that Rafael Nadal/Roger Federer 2008 Wimbledon final (in part, because they never moved from that spot to avoid jinxing their man). Fans might only make it to the Open for one day, but they'll religiously follow the rest of the event on TV and the web. Watchers - Generally consider the Open a great New York event, a place to see and be seen. Watchers know a fair bit about tennis and probably even play. They come to the Open wanting to see Federer or Nadal, no doubt, but they also wouldn't bat an eye missing a couple of games to grab a Chardonnay or a Heineken either. The watchers will make it out to the Open over Labor Day weekend usually, ask who won the final if they were otherwise engaged that day and then go about their normal lives until next year. Let me be clear: there's no (read: only mild) judgment here. In my experience, having attended the tourney with people on both sides of the spectrum, I've learned that there are very different ways of experiencing the US Open and they each can be a great time. By breaking it down, our aim is to give both sets of attendees their optimal Open experience and maybe teach each a bit about how the other half rolls. In some cases, we'll mark advice "For All," which self-explanatorily means that both sides of the aisle should find this information useful. Let's get going. For All - Buy your tickets on TicketMaster or TicketExchange, or on site at the Tennis Center if tickets remain available end of story. I know there are tour companies selling US Open tickets and packages and I'm sure they do a fine job, but I'm not a fan of needless markups. Unlike at Wimbledon, where show court seats can be notoriously difficult to come by, some US Open tickets can be purchased at face value right up through the first few days of the tournament on TicketMaster. TicketExchange is a TicketMaster powered, legal, secure aftermarket service to buy tickets from fans (presumably) who need to sell. Tickets there can be above face value, but they're guaranteed to be real and can get you into a session in a pinch if you just have to see a certain match or have a last-minute opportunity to get out to the Open. That said, tickets for both finals weekend and the middle weekend (which always coincides with the Labor Day holiday) sell out on Ticketmaster virtually as soon as they go on sale. My suggestion if you simply MUST attend the men's final, for example, and you don't have tickets yet: wait until the last minute and jump on TicketExchange. In 2010, when Nadal booked his place in the final for the first time, prices (even along the upper rim of Arthur Ashe Stadium) spiked to $300 and up. A few hours later, Djokovic upended Federer and, no disrespect to the Djoker, the market crashed. Prices on TicketExchange and other after-market websites were slashed in the moments after the Serb thwarted the longed-for first Federer/Nadal final in New York. It's a risk for sure, but one that may well pay off. Oh, and coming to the US Open doesn't have to be expensive. You can sit courtside for sure, and some of those tickets cost more than my first car, but tickets start under $30. For some sessions discounted US Open tickets are available to savvy online shoppers letting them see quality tennis, even in the vaunted second week, at bargain basement prices. Last thing, you won't know who's playing or where until around 5PM the day before your session. Sorry, it's the inconvenience of a single-elimination sport, but that ensures that every match is important and that neither players, nor fans can afford to take any matches off. For All - This is in fact, New York. The "move it or lose it" mentality does reign. Now, that said, New Yorkers are not rude people, we're happy to give directions, recommend a restaurant, and so forth. It's just that unlike more tourist centric destinations, Disney, Vegas, the Caribbean, for example, we're also going about our everyday lives while you gawk, saunter six-wide across the sidewalk and take eons to snap pictures of your crew. If there's a tip I could give every New York visitor it would be, be aware and step aside. Why? Well, if your suburban shuffling happens to make us miss a train and you'll be glad that looks, in fact, can't kill. For Fans - Take the 7 train to Queens out of Grand Central station. It can feel excruciatingly slow at times, because there are a lot of stops (17 if you catch the local). The MTA, though, claims it's only a 31-minute ride. That said, for $2.50 each way, you don't have to hew to a schedule, pay for parking or worry about Mets fans filling the parking lots by the Tennis Center (which is adjacent to Citi Field, New York's other baseball stadium). Not to mention, you'll get some real New York flavor walking through bustling Grand Central, taking the train past the Notorious B.I.G. mural and through the neighborhoods of Queens on your way to the tennis. As a bonus, after the day's matches are over, you can take a detour for dinner into Flushing Queens' bustling Chinatown, accessed at Main Street-Flushing, one stop past the Open. Many New Yorkers consider Flushing's Chinatown to be less expensive, less touristy and more authentic than its celebrated Manhattan cousin. For Watchers - Skip Grand Central and start your journey on the West Side, take the Long Island Railroad (LIRR) to the Mets-Willets Point station. Yes, it's $7.25 each way and runs on a schedule versus the more free-flowing subway, but it's a two-stop, 16 minute ride from Penn Station and you can almost always get a seat. No fuss, no muss. For Fans - I will assert and fiercely defend this point to anyone who'll listen. Day Session, Arthur Ashe, First Week, end of story. A day session ticket to the first week in Ashe is simply the best value in all of sports. Imagine if all of NCAA "March Madness" was unfolding in one stadium complex. That's what the Open is like and with any ticket to Ashe you can look in at any of the 20 or so matches happening at any given time; singles, doubles, men, women, whatever you want. Save for the risk of sunburn, it's better than DirecTV. My typical stomping grounds are the upper promenade of Ashe stadium for these sessions. Why? 1) Lower promenade tickets can cost twice as much to get you just a few rows closer. In a stadium the size of Arthur Ashe, that doesn't mean a lot. 3) Fans won't spend much time there. I, for example, typically will pop in for a set of Serena, a bit of Rafa, a look at Nole and then head to the outer courts where I can get a lot closer to a lot of other players who shouldn't cruise through their early round matches. One important thing to know if you're a veteran of other majors: The US Open is the ONLY major where a ticket to the main showcourt (Arthur Ashe Stadium) will grant you the ability to access all of the other show courts (Louis Armstrong Stadium, The Grandstand and Court 17) as well at no additional charge. For Watchers - It's all about night session for you, late first and early second week preferably. This is when the stars come out, both on and off court. The US Open typically rotates any of the following players in their night sessions: Federer, Novak Djokovic, Nadal (less than some of the others reportedly because of the requests of Spanish TV), Serena Williams, Venus Williams and Victoria Azarenka. Night session tickets generally get you two matches (one men's and one women's) in the electric atmosphere of Arthur Ashe stadium under the lights. Anyone who's done both day and night matches would agree, there's an extra energy to night matches (perhaps fueled by beer) that make them even more of a happening than a similarly compelling contest under the Gotham sun. As a bonus, night session tickets usually will grant you access to the grounds by 6PM. Meaning you can pop over to a side court to see some action close up or grab the first drink of the evening at the wine and beer stations just outside of Ashe before they let in night session ticket holders at 7 or the end of the day session matches, whichever comes later. For All: No, you can't just buy tickets to the Djokovic or Sloane Stephens match. You buy tickets to a session, whoever is scheduled to play, plays, and you'll like it! No, seriously. This is a unique aspect of tennis. It's a single elimination sport, with as many as twenty matches going on at any given time and subject to the vagaries of weather. The good news is that the schedules are relatively balanced so that one day No.1 seed plays, the next, the No. 2 seed is scheduled and vice versa, so don't worry you'll usually be guaranteed compelling action and fan favorites. The best way to ensure that you see your favorite player is to go for the first three days (and two nights) of the event, when all the singles first round matches are played. Especially if your favorite has a bad habit of being bounced early. Serena Williams fires a backhand. For the most part, after the first match of the day at 11AM; match times aren't scheduled. When one match ends another will kick off about 10-15 minutes later. Keep an eye on your smartphone (if you can get service) or the electronic board at Ashe or Louis Armstrong to know what matches are starting, in progress and/or ending. One more note, when you walk in, make sure you have a schedule of play handy, whether it's the official drawsheet on sale for $5 at the tournament or one printed from USOpen.org. You're flying blind and missing a ton of good tennis without it. I find my smartphone tends to near the end of its usefulness around 5PM, here's a case where old-fashioned paper can save your battery as well as your sanity. Once you've got a schedule, start figuring out who you want to see and when they'll go on. Here's a good rule of thumb if your phone service isn't connecting, a women's match should be nearing conclusion in around 90 mins, a men's match in a little over 2 hours. That said; match lengths vary wildly. If you simply must see a certain player, get to their court before the prior match ends. For Fans: Forget the names. Look for the matchups. One tip is: know your rankings, especially early. Since the top 32 players in the draw are seeded, find the players just outside that tier and the unlucky seed who drew them. When's someone's been injured or had a bad run of form that's caused their ranking to sink below their talent level, they're called dangerous floaters. Venus Williams (currently 60th), for example is drawn to play 12th seed Kirsten Flipkens in the first round. Venus, if healthy, is a more projectile missile than a dangerous floater and the match will be on Ashe, because she's Venus, but you catch my drift. A better example would be Ivan Dodig ranked 38th in the world, facing 27th seed Fernando Verdasco in the first round. Just tough luck there, Nando. Fans always know where those matches are (often the Grandstand court, much like the Madison Keys/Jelena Jankovic contest that follows on Monday) and the seats fill up quickly. There are also plenty of dangerous floaters who aren't household names and will give fans an incredible show. Last thing, if this logic doesn't hold up, don't get too annoyed; go somewhere else. The fact there are so many matches means that you never have an excuse to be bored by the quality of the tennis. If it's the second week, check out some of the junior tournament. It only takes a few years for a promising junior to start playing at the top level of the game. One of the reasons I always back Tamira Paszek is that I saw her for the first time playing in the junior final here back in 2006 and pegged her as one to watch. Plus, what's better than talking to a tennis loving friend about a new phenom and being able to smugly and nonchalantly mention, oh yeah, I remember her as a junior, her backhand's so much better these days. Not that I'd ever do such a thing. For Watchers: Yes, see Roger, Novak, Serena, Vika, sure. Who next? If it's the first week, go see Lleyton Hewitt, Tommy Haas, James Blake or Svetlana Kuznetsova for starters. In other words, go see some of the top players who are nearing the exit ramp of their careers. They usually still have serious game, passionate fanbases and a bit of the magic that got them to the top--even if they can't sustain it long enough to win seven consecutive matches at the very pinnacle of the sport anymore. Also, there are just some players that are ridiculously fun to watch. You could know nothing about this game and find yourself mindlessly crunching popcorn, enthralled by certain players. To watch someone just hit the ever-living-snot out of a tennis ball is always fun if you can do it close up, I strongly recommend Teymuraz Gabashvili, Sabine Lisicki or Ivo Karlovic. If Gumby-esque acrobatics and eye-popping saves are more your thing, get courtside for Jelena Jankovic, Sara Errani or Gael Monfils. You will not be sorry in either case. Lastly, if you're at the food court or the gift shop and you notice two guys have just split three tight sets, find that court and make your way over. It'll probably be packed, maybe even standing room only, but you'll never regret setting yourself up to watch a five setter at the Open. For Fans - There's nothing like the Grandstand. 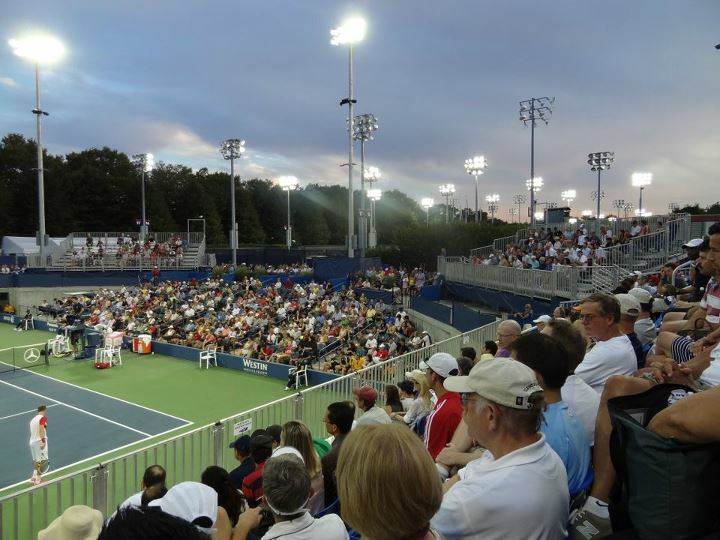 The Grandstand is the USTABJKNTC's third showcourt; a 6,000 capacity venue that's arguably the greatest place in the world to watch the pro game. Grandstand matches usually feature the Stanislas Wawrinkas, Maria Kirilenkos and Mikhail Youzhnys of the world. Fun players to watch, fan favorites and players who will make an impact on the end result of the tournament, but not the players that watchers would be able to pick out of a lineup. 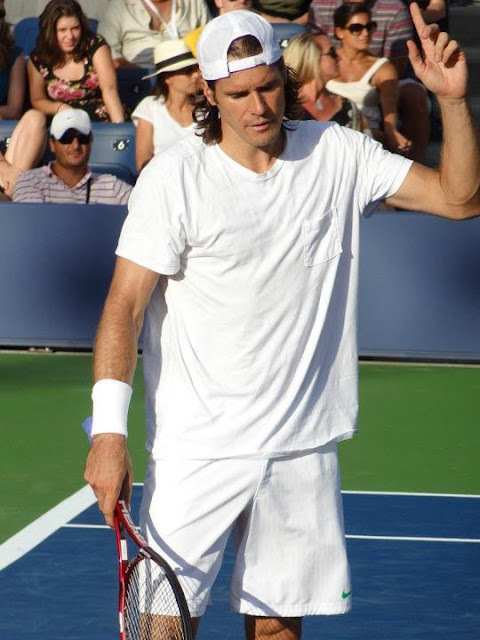 In the early days of the event, there is also usually a strong American contingent getting the opportunity to play on a showcourt at their home major. Forget courtside on Ashe, the absolute most coveted seats in the entire complex are the Grandstand's shaded seats under the overhang of neighboring Louis Armstrong stadium. I can remember scoring one of those coveted seats all of maybe twice in fifty plus visits to the Open. Consider that a testament to being a treasured respite from New York's hot, humid summers and the quality of matches typically featured on the Grandstand. One aside, there are actually a few concession stands tucked between the Grandstand and Armstrong, so you don't have to leave the area to grab a quick Evian or chicken fingers. If these are indeed the last few years for the Grandstand and Louis Armstrong stadium, which are set to be demolished as they're reportedly sinking back into the marshland on which they were built, what I'll miss most is a superfan secret that I'll share with you. Around the back of Louis Armstrong stadium there are stairwells which are my absolute FAVORITE part of the entire complex. Climbing those stairs will burn maybe half a chicken finger, but they will also allow you to bypass the lines and ignore changeover-only entry into Armstrong. As a bonus, when you reach the very top, you have the choice of either sneaking into Armstrong, or taking in unique overhead, standing room only views of the Grandstand. There are also bathrooms and vendors up there that aren't nearly as mobbed as those on the main concourses. This should go without saying, but as a fan and good citizen of the game, please bear with me while I make this disclaimer. If you are going to sneak into Armstrong during a game, do so quickly and discreetly, take the first available seat at the TOP of the stadium as not to distract the players and other fans and then scurry downward at the first moment of a changeover as the ushers are letting the crowd in below. You've got a real gift here. Don't ruin it for everyone. 2011 also saw the introduction of a brand new fourth show court, Court 17 at the Tennis Center. Court 17, seemingly a carbon copy of Margaret Court Arena at Melbourne Park is an intimate sunken, bullring of a court that is home to a number of compelling matchups. In 2011, organizers programmed lots of up-and-coming Americans here such as Jack Sock and Donald Young as well as non-American fan favorites such as Sergiy Stakhovsky and Richard Gasquet who inaugurated the new court last year. While it doesn't have the history, or the shade, of the grandstand, Court 17 is becoming a fan favorite in its own right for being a beautiful, compact venue to watch top class tennis. For Watchers - American Express always has a prominent presence at the tournament, highlighted by AMEX Radio at the Open, which largely provides an audio simulcast of the commentary accompanying matches happening on Arthur Ashe. 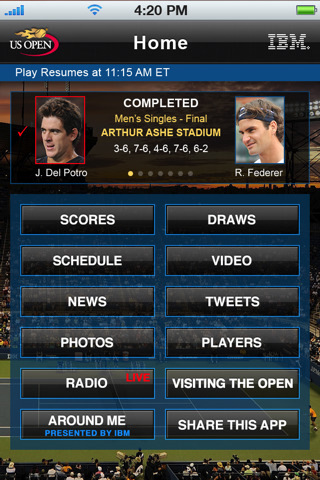 Being there live with AMEX radio is like watching the matches in Ultra High-Def. If you, or your companion, has an AMEX card, grab a radio for sure, it can certainly augment the experience during some of the tourney's quieter moments. Between matches, it's always a good idea to find your way over to Court 4 then walk as far up the bleachers as you can go. Sure, there might be a good match going on over there, but that's not why there's a crowd. It's the best place to get a view of the practice courts and watch some of the world's best working out the kinks in their games. I'm sure you recognize this blonde (Maria Sharapova) having a hit on Practice Court 3. Sometimes you'll catch even rarer treats like Martina Navratilova last year having a hit with her Tennis Channel colleague Jimmy Connors. That's nine US Open titles on court at one time, really special stuff! Also, if there's a certain player you just have to see, check the doubles draw. A number of top players enter the doubles as well, the Williams sisters often play, Caroline Wozniacki, John Isner, Mardy Fish, Jelena Jankovic, Gael Monfils and Vera Zvonareva have all, among others, played US Open doubles in recent years. The biggest advantage of seeing the stars in action in doubles is that you get far closer to the action, sometimes it's as if you're watching some of the world's best players play at a public park. The proximity also means that your chance for close up pictures and autographs increases exponentially. Not to mention, doubles' rapid-fire action at the net is often in distinct contrast with the prevailing baseline warfare mentality on display in the singles. Watching and taking lessons from the top players on the doubles court can help you add new wrinkles to your own game. Changeovers - If you're sitting in the lower level of the stadium, you're not getting back in until a changeover. Don't get huffy, don't make the audible sighs of annoyance, don't ask if the usher knows who you are. This is tennis; you're not getting back in. Oh, and since the players don't sit until the third game of a set, you're not getting back in until then. Avoid leaving at the end of a set because it'll take you three games, not the usual two, to get back in. Saving Seats - If the court is crowded, especially Armstrong or the Grandstand chances are ushers are only letting a few people in, in the order they're in line. You can't really save a seat in this situation because there's no guarantee that your weak-bladdered buddy is getting back in. There may be a place for your friend when they get back in, but first things first. You're Not A Line Judge - No one cares if you thought the ball was out. Not the line judge, the umpire or either player. In fact, since you're not on the court, it's a fair bet your angle of sight isn't as good as theirs. Shut your mouth during the point. At best, you win a parlor game with no prize. At worst, you can distract the players during a key juncture of the match. It's a no-win situation, so leave the line calling to the judges...and/or Hawkeye. No Laptops or Big Bags - The US Open prohibits backpacks and laptops, let's be honest, you're going to finish that spreadsheet or study for your LSATs anyway. For a full list of prohibited items, visit the US Open's website. It will save you a lot of frustration deciding whether you should use the off-site storage facility or take your precious MacBook Air back to its Manhattan cocoon. Also, for football (soccer) fans thinking of making tennis their next favorite sport, vuvuzelas are strictly prohibited, sorry. Quiet Please - A lot of sports fans don't understand the fact that tennis is generally played in quiet, for good reason, it requires concentration. A baseball player who gets a hit 3 times out of ten is a superstar, a tennis player may need to hit 10 shots in a row that are moving at the speed a major league fastball, in a batter's box larger than a typical New York City apartment. Oh, and that's to win a single point. Also, leave your infants at home; David Ferrer is entered in the tournament. Your Phone - Text and tweet all day, quietly tell someone (during a changeover) that you'll call them back as soon as you're out of the stadium...but turn your ringer off and don't try to have a "quiet" conversation with your mom during the match. Especially if she doesn't know what Victoria Azarenka sounds like playing tennis. We spend a lot of time at the US Open every year, but we don't claim to know EVERYTHING. Got a few tips you want to share, that's what the comments section is for. Enjoy the Open, kids! That X-33 Skywalker provides an been refined classic X-33 court case model it is an important a good deal rolex replica uk truer today's interpretation. Moreover it comes across as being fake rolex even more to be a "Speedmaster. inch As a result is that Z-33 an impressive problem? This can be a ideal thought, and even since i have definitely cherished substances fake hublot uk belonging to the Z-33, We not even phone call the application a mistake so it weren't a terrible sit back and watch -- no matter what to be highly tall in height in the arm. However, the problem considering the Z-33, It looks like, is without a doubt that should be not even everything that Omega sit back and watch couples preferred. Join an important famous airline sit back and watch along with a today's aerospace watch out for a far more today's fake omega uk method sit back and watch? The application really do not accomodate that arising court case model this was at the same time hublot replica avant garde. Enjoy Breitling utilizing Aerospace assortment of running watches, Omega's achieving success considering the X-33 is which will exact aviators and even astronauts was opting for to help you put them on. It's really a pleasure to watch live big tennis game on a holiday. Never before I have experienced such types of live tennis matches, every time I used to watch it live on television. I never miss any kind of big or small tennis tournament and honestly, say that audience of every game will bring some cheerful moment in the ground, they used to encourage players and improve their motivation power through kind support. Here also in this post, we have found some pictorial collection of important matches and their fan list; thanks for updating such important topics.